More than half a million people in Cameroon’s Far North region are in need of urgent food aid, the government says, as attacks by militant group Boko Haram have forced farmers to abandon their fields, shut down local markets, and halted the movement of people and goods. Food security, particularly along the border, is getting worse due to the regular arrival of Nigerian refugees, who often rely on host communities for food. “Unless something is done to aid farmers and supply local markets with basic commodities, the region is at risk of famine,” said Midjiyawa Bakari, the governor of the Far North. The UN Office for the Coordination of Humanitarian Affairs (OCHA) estimates that 54 percent of households in the North and Far North regions of Cameroon now face food shortages. UNICEF estimated the rate of global acute malnutrition in the Far North to be 9 percent in November. Cameroon’s Ministry of Agriculture and Rural Development (MINADER) says the situation has “deteriorated sharply” since then and that malnutrition rates among children under five are now higher than 20 percent in many of the affected communities. This exceeds the World Health Organization’s emergency threshold of 15 percent. An assessment this month by MINADER in Far North’s three most affected departments, Mayo-Sava, Mayo-Tsanaga, and Logone and Chari, found that an estimated 70 percent of farmers have deserted their farms, and many more have missed out on key farming activities, such as timely planting, during the past six months. “Attacks by Boko Haram came very close to my village and we were all forced to leave,” Dan Mustapha, a farmer from Mayo-Sava’s Moro village, told IRIN. His family’s two hectares of farmland – normally sown with sorghum – remain unplanted this season. Boko Haram has been active in neighboring Nigeria since 2009, killing thousands and displacing nearly a million people, according to the International Organization for Migration. Cross-border attacks by Boko Haram into northern Cameroon have become more frequent and increasingly violent in recent months. More than two dozen villages along the border have been raided since early December. At least 80 people were kidnapped earlier this month. The government says that at least 10,000 Cameroonians have now fled their homes in fear. Additionally, dozens of hectares of land in Mayo-Tsanga originally meant for agriculture, have been turned into refugee camps or settlements for the internally displaced. Government curfews, which forbid the movement of people and vehicles between 7pm and 6am, have restricted many of the remaining farmers from properly working their land. As a result, the production of cereal crops, such as sorghum, millet, cowpea and rice, dropped by more than 50 percent last year, according to MINADER. The Ministry estimates the region needs 770,000 tonnes of cereal each season, but only 132,000 tonnes were produced in 2014. This is compared to 2012, when the region produced an estimated 509,000 tonnes. 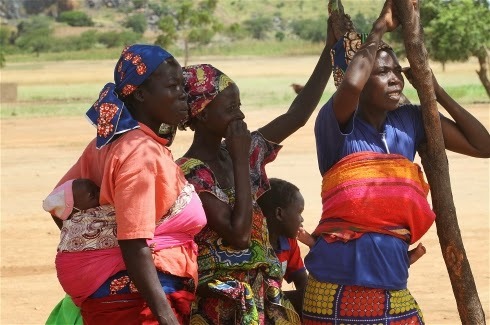 “This [violence] has had a serious impact on regional output, because the populations in Mayo-Tsanaga, Mayo-Sava, and Logone and Chari, are predominantly farmers and traders and herders,” said Jean Vevet, an official from the Ministry of Agriculture and Rural Development’s regional delegation. Residents say their meagre stocks have already begun to dwindle. Many farmers report having begun to eat the grain that was reserved for seed. More than 60 percent of the region’s income usually comes from cross-border trade with Nigeria and Chad, according to MINADER. But with no goods to sell and very few customers, many merchants have now fled their market stalls all together. The cross-border cattle business, one of the mainstays in the region, has also drastically slowed. “The economic setup of the region has totally been disrupted,” said Samuel Bello, a bank manager in Maroua. “This has a serious impact on every income generating activity in the area. Fewer customers come to save money in the banks today, because the usual sources of income are threatened,” he told IRIN. Fear of attacks have also caused many traders to flee their posts, further disrupting the local economy. “It is difficult for us to get a regular supply of vegetables and fresh food,” said Alim Dubou, a vegetable trader in Maroua. “No one wants to drive along the highway,” he said, citing an example from earlier this month, when at least 15 passengers were beheaded by suspected members of Boko Haram, while riding a bus between Maroua and Kousseri, according to local and international news reports. A lack of markets and goods has caused the price of rice in Kolofata, a community in the Mayo-Sava department that has suffered the brunt of Boko Haram attacks, for example, to increase from $0.34 per kilogram to $0.52 per kilogram, over the past 10 months. The prices of other basic commodities, such as corn, sorghum and petrol, have risen by 20 to 80 percent since March 2014, according to MINADER. Cameroon’s government says it is now working closely with humanitarian and aid agencies, such as the World Food Programme, UNICEF and the UN Refugee Agency, to provide food, shelter and health care to both refugees and communities hosting them. However, funding constraints and insecurity along the border have limited their actions. In response to the influx of refugees and rising food insecurity, the government scaled up its Strategic Response Plan for 2014-2016, and is now calling for US$126 million to help the most vulnerable. The funding will help provide emergency food aid and agriculture inputs to the population, Vevet said. On 16 January, President Paul Biya also promised to deliver “tonnes” of cereal, including rice, millet and sorghum, along with edible oil and other consumer products, to the region, but did not say how much or when it would arrive. Sufianu Salifa, a 47-year-old cowhide seller, fled to Maroua from Kolofata with his five children..